In just one decade, societal trends, research and technologies have dramatically changed expectations for midlife and beyond. The emerging Positive Aging movement stems from new understandings about our capacity for growth and renewal “through the last breath.” New technology is expanding opportunities for active, productive aging. At the same time, economic and financial shifts have created an intimidating future for millions of older adults. Too many are unprepared for current and future changes and unable to plan or seek ways to help themselves, each other, and their communities. 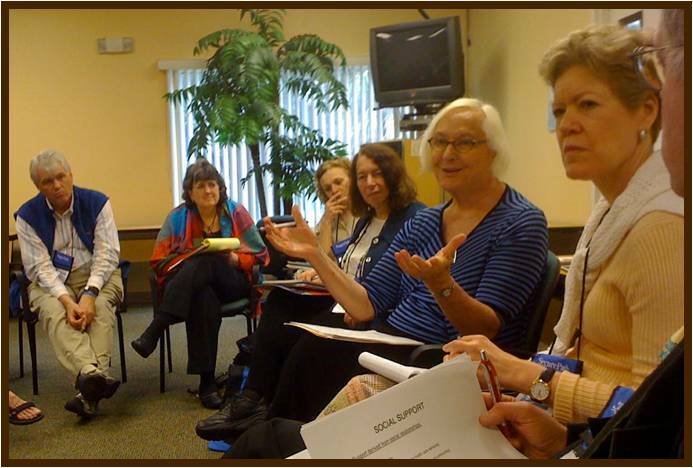 The Advocacy Leadership for Positive Aging program is being developed by the Life Planning Network. As committed advocates for Positive Aging, the curriculum leaders are reaching out to engage those who work with older adults in a “train the trainer” process. Service providers and community elders will be prepared with the understandings and tools to act as advocates and coaches for themselves and their clients to increase their opportunities for positive aging. Read about the Field Work Projects implemented by past participants. ALPA Goal. The goal of the program is to empower low and moderate income seniors to: a) expand understanding about opportunities and challenges for positive aging in the 21st century, b) identify their strengths as well as their needs in relation to positive aging, and c) find and use planning resources that will improve their expectations for the future. Our strategy is to prepare service providers working with older adults with knowledge and skills that will benefit them, their work, and their clients. This action-learning program will prepare providers to be effective advocacy leaders for positive aging. The program charges the participants with sharing their new knowledge and skills with their clients. The clients will be assisted to advocate for themselves and to increase their self-management of ongoing challenges. Format. The program is designed as a six-session action-learning program for agencies/organizations to offer to their employees or volunteers or students who work with older adults. The organizations will provide a meeting location and an on-site coordinator who is an experienced group facilitator. The Life Planning Network curriculum team has prepared a free on-line curriculum on a Google+ website, with a separate folder for each group of participants. On-line Curriculum. The on-line curriculum includes action learning assignments and readings for participants to prepare for each face-to-face session. During the first four weekly sessions, each group will watch and discuss slide presentations with recorded narration by topic experts. The participants will also discuss their assignments and get to know each other and their related work interests and challenges. Then they will break for a month while they work on individualized fieldwork projects, making use of what they have learned, with support from a coach. During the last two meetings, they will report on their projects and reflect on their experiences in relation to their goals. For satisfactory completion of the program, participants will receive a certificate at a graduation ceremony planned by the group. Participation. A circle of 12 to 25 participants will be recruited for each cycle of the non-credit training program. Admission requirements would include past or present experience working with older adults (paid or unpaid work). Participants will be expected to: a) attend each session; b) read and view background materials between sessions; c) complete assignments and participate in class discussions; d) develop, implement, and report on an individualized fieldwork project; and e) provide feedback for program evaluation. Website. The ALPA website shows what is needed by all of the on-site coordinators and participant groups, including: program introduction; a folder for each session that contains an agenda, assigned and optional readings, powerpoint presentations, and instructions for assignments; a resource list; evaluation tools and reports; and a chat room. With help from each on-site coordinator, a folder is prepared for each participant group, with photos and brief bios for participants, and a secure sub-folder for each participant’s assignments. Costs. The free on-line curriculum has been developed by pro-bono experts and will be available for both community outreach organizations with plentiful resources and those that are strapped for professional development funds. The host organizations will be responsible for recruitment, coordination, customizing the website, and assuring excellent facilitation. They may assign their own staff and use their own space for the meeting location, or they may use their own funds or secure grants to customize the program and pay for coordination and facilitation. Diversity. Special attention should be given to assuring inclusion of diverse participants and presenters. Accommodations, learning materials, leadership — all aspects of the curriculum will be open to adaptation to assure inclusivity. ALPA Network. One intended program outcome will be an Advocacy Leadership for Positive Aging (ALPA) Network through which graduates can connect with each other informally across groups, with a web-based resource center to assist their work with older adults. ALPA’s expanding website resources… including examples of best practice, a bibliography, links to web-based resources, and lifework planning tools… will be available to graduates on an ongoing basis, as well as to current participants. Reflect on what is needed for effective advocacy, and consider some next steps, including networking with others, to assure progress. Several participants are working on projects together. Nine of the 11 participants worked on projects together.